In 1967 Hannes attained his B.A. Degree in Fine Art and the Higher Teachers Diploma at the University of Pretoria and during December of that year he got married to Cecilia van der Westhuizen, a teacher from Bloemfontein. After this Hannes mainly spent his time and energy on being a husband and a father of four children and on his career (initially as a school teacher and later as an official of Old Mutual). During these years he still practised fine art as a hobby and a method of relaxation. During 1988 he had another solo exhibition at the Museum in Caledon. Hannes retired from Old Mutual in 1997 to apply himself full time to painting. In November of that year he had a successful solo exhibition at the St Pauls church hall in Stellenbosch. 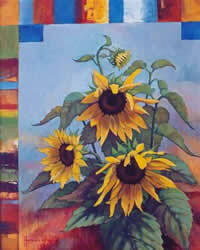 During February 2002, eight of his paintings were exhibited at the annual Flower and Garden Show in Seattle, USA. 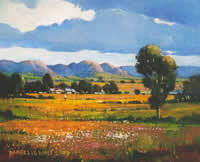 Hannes is an artist, who loves the scenery around Stellenbosch and the Boland. He is inspired by the rich colours during flowering season in Namaqualand, the wide open spaces of the Karroo and the interesting coast line of the Western and Southern Cape. He mainly paints in a realistic-impressionistic style, but sometimes also experiments with abstracts. He is especially attracted to the rich textures of objects and their surroundings. This preference can be observed in his collages as well as his still life studies, where flowers, fruit, vegetables and other objects, each with its own texture and qualities of light reflection, is combined. Hanness paintings appeal to each persons inner appreciation for the beauty of nature, but also calls to mind the inconceivable wonder of Gods creation. His work can be found in various local galleries and in many private collections in South Africa, Australia, America, Britain, The Netherlands, Belgium, Canada, Germany, France, New Zealand, China and South Korea.